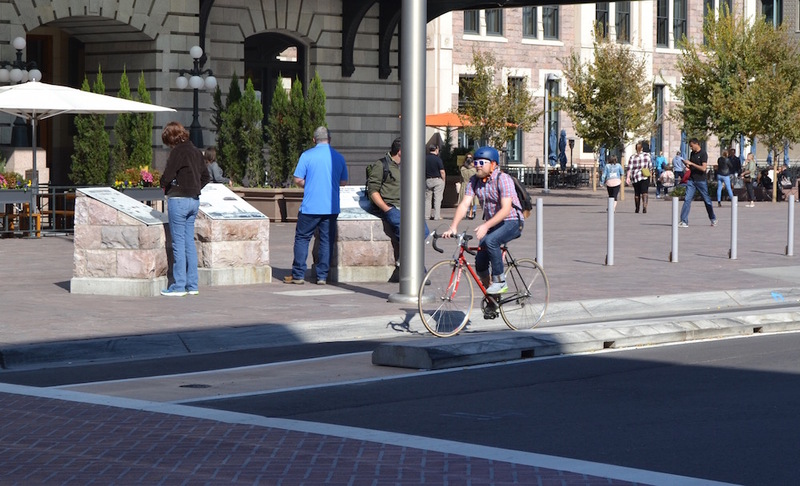 If any Denver street should prioritize people walking and biking, it’s Wynkoop Street in front Union Station — the city’s busiest transit hub. Union Station is the primary terminus and launch point of RTD’s rail and bus system and an oft-touted symbol of Denver’s supposed commitment to curbing car dependence. In its second makeover in two years, Wynkoop is much better for pedestrians and bicyclists than it once was. But a design that prioritizes parking on one side of the street, combined with a lack of serious enforcement, ensures the inevitable: Drivers parking in the bike lanes and pulling dangerous U-turns on a street filled with people walking and biking. Brand new Wynkoop St. bike lane this morning. #streetfail (2/2). Denver's multimodal hub at Union Station! 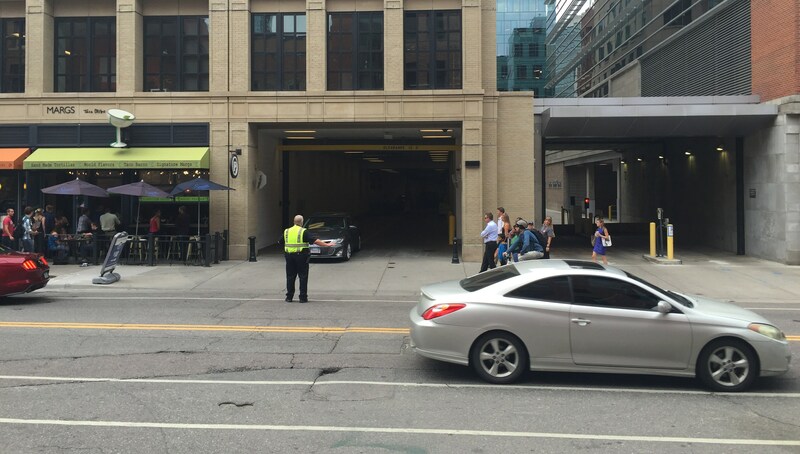 DPW actually removed curbs from the bike lane this week to create a loading zone in the bike lane so people with disabilities can access taxis and ride-hailing vehicles. 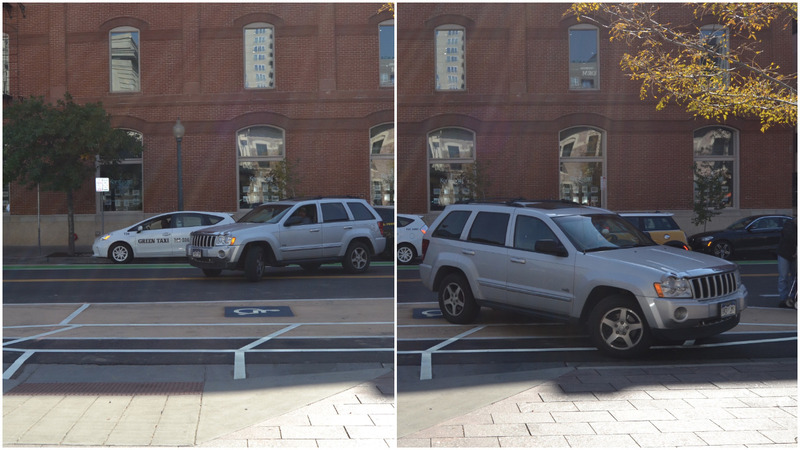 Drivers are already using the space as a parking spot and to pull illegal U-turns. This busy urban transit hub has to serve everyone safely, and so far, the most vulnerable street users are in the most danger. Having a right-of-way enforcement officer dispatched in front of the station all day writing tickets on a zero-tolerance basis would help protect people — and the city’s investment. In other parts of the city where the street design isn’t strong enough to force safe driving behaviors, police officers direct traffic. But unlike the traffic management setup below (one block from Union Station), Wynkoop Street needs the kind of management that puts people walking and biking first. It’s time for the Hancock administration to employ measures at the city’s multimodal nexus that back up all the talk about ending traffic deaths and doubling walking, biking, and transit trips. Anything less would make the administration’s Vision Zero initiative and other “mobility” goals little more than slogans. The setup is backwards. In Amsterdam they solve this by putting the parking lane next to the driving lane. Then a curb, then about 5 feet of sidewalk (for loading and unloading of cars/vans/buses), then the green colored pavement for bikes, then the sidewalk for pedestrians. So, from the middle of a street it goes: yellow line, driving lane, parking lane, curb, loading/unloading zone, bike lane, pedestrian walkway, outdoor seating for cafes, and finally the wall/entrance to a building. I bet there is enough room in front of Union Station to do it this way.